Cervantes-Hern�ndez, P., Flores-G�mez, A., Ja�me Serrano, S., Ramos Cruz, S. & Gallardo Berumen, M. I. Historical exploitation and evaluation of the brown shrimp fishery Farfantepenaeus californiensis (Decapoda, Dendrobranchiata) in the Gulf of Tehuantepec, Oaxaca, Mexico. Pan-American Journal of Aquatic Sciences, 5(4): 486-494. Download PDF file (263 Kb). Campos, R. F., Nunes, J. A. C. C., Medeiros, D. V. & Sampaio, C. L. S. Simultaneous reproductive event of two species of the genus Labrisomus (Labrisomidae) in Northeastern Brazil. Pan-American Journal of Aquatic Sciences, 5(4): 495-500. Download PDF file (863 Kb). Ven�ncio, Fabr�zio. A. & Leme, M. H. A. The freshwater crab Trichodactylus petropolitanus (Goeldi, 1886) (Decapoda, Trichodactylidae) associated with roots of Hedychium coronarium Koenig (Zingiberacea). Pan-American Journal of Aquatic Sciences, 5(4): 501-507. Download PDF file (462 Kb). Bernini, E. & Rezende, C. E. Litterfall in a mangrove in Southeast Brazil. Pan-American Journal of Aquatic Sciences, 5(4): 508-519. Download PDF file (702 Kb). �elik, K., Akbulut, N., Akbulut, A. & �zatli, D. Macro Zoobenthos of Lake Uluabat, Turkey, related to some physical and chemical parameters. Pan-American Journal of Aquatic Sciences, 5(4): 520-529. Download PDF file (555 Kb). Zanatta, A. S., Perbiche-Neves, G., Ventura, R., Ramos, I. P. & Carvalho, E. D. Effects of a small fish cage farm on zooplankton assemblages (Cladocera and Copepoda: Crustacea) in a sub-tropical reservoir (SE Brazil). Pan-American Journal of Aquatic Sciences, 5(4): 530-539. Download PDF file (714 Kb). Cardoso, R. S., Caetano, C. H. S. & Cabrini, T. M. B. Imposex in Nassarius vibex: relationship with harbor and yachting activities at five beaches in Sepetiba Bay, RJ, Brazil. Pan-American Journal of Aquatic Sciences, 5(4): 540-545. Download PDF file (453 Kb). Magris, R. A. & Barreto, R. Mapping and assessment of protection of mangrove habitats in Brazil. 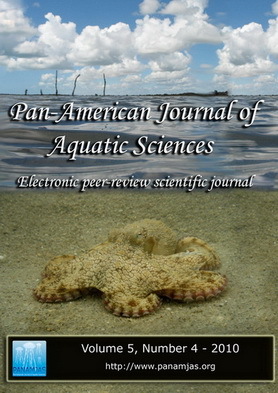 Pan-American Journal of Aquatic Sciences, 5(4): 546-556. Download PDF file (1,298 Kb). Silva, J. S., Silveira, W. T. & Palma-Silva, C. Diversity of Chironomidae (Diptera) in decomposing Nymphoides indica (L.) Kuntze in two subtropical lakes with different trophic conditions. Pan-American Journal of Aquatic Sciences, 5(4): 557-571. Download PDF file (1,154 Kb). Tubino, R. A., Moraes, L. E., Rangel, C. A. & Monteiro-Neto, C. A new record for a Tremoctopus violaceus Chiaie, 1830 (Mollusca, Tremoctopodidae) from Rio de Janeiro coast, southeastern Brazil. Pan-American Journal of Aquatic Sciences, 5(4): 572-576. Download PDF file (363 Kb).